The structure that is now Tocal Visitor Centre was once a hayshed, probably built in the early 1900s for the Reynolds family, owners of the famous Tocal cattle and horse studs. The hayshed was unused for much of the Alexander period at Tocal, as they made little hay. The shed was typical of the times, with a bare earth floor and large internal posts. These massive posts of locally-grown Ironbark now feature in the structure after its adaptation as a Visitor Centre, although the outer posts have been replaced with Tallowwood. Above: at left, the hay shed built in the early 1900s, and at right the shed transformed into the Tocal Visitor Centre. 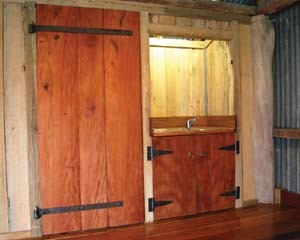 Below: red cedar internal doors. The Tocal Visitor Centre showcases the hardwood timbers of coastal NSW. The bearers and joists are Blackbutt from the Coffs Harbour and Cessnock areas, while the timber battens between the joists are Spotted Gum. The flooring of the Centre is recyled Blackbutt from the demolished Honeysuckle Wool Stores in Newcastle. The internal doors are made from a magnificent Red Cedar tree that was salvaged from the banks of the Paterson River at Tocal after the tree died . Red Cedars are the icons of the Paterson and Hunter Rivers. The original walls of the shed are on the inside, and an outer skin has been added, with all services hidden between the two layers. It is effectively a shed within a shed. To complete the transformation, the building was fitted with a massive glass front, with a framework of Western Australian Karri. The glass roof over the front door encloses the open section of the original shed while preserving its effect. 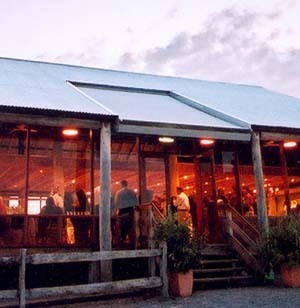 The spacious feel and magnificent view over the lagoon and rural landscape have made the Tocal Visitor Centre a popular venue for weddings and function. For further information phone 02 49398888 or email info@tocal.com.